Sugar free gummy butterflies may be one of the best ways to brighten up the day. Just their stunning assortment of colors can lift someone’s spirit. Their chewy texture and burst of flavor can shake up your taste buds. Kids and adults can enjoy the immense pleasure these flavorful little butterflies provide. 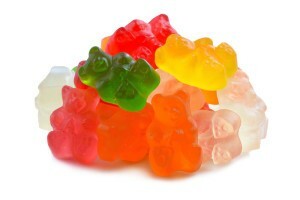 Maltitol, Gelatin, Lactic Acid, Citric Acid, Natural & Artificial Flavors, FD&C Yellow No. 5 & 6, Blue No.1, Red No. 40, *Aspartame, Vegetable Oil (Coconut Oil), Carnauba Wax (used for anti-sticking). One bag contains about 100 pieces. Caution: Excessive consumption of this product may have a laxative effect. Earn up to 106 points.